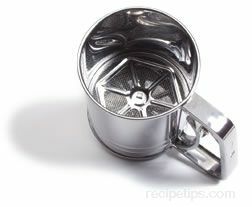 A kitchen utensil with a mesh bottom used to sift dry ingredients, such as flour or powdered sugar. The most common Sifters are built with a trigger in the handle that is activated to move back and forth in order to push and pull the dry contents through the mesh sieve in the bottom of the Sifter. Made from stainless steel or plastic, the Sifter is used to add air to the dry ingredient in order to make it lighter and more uniform in texture resulting in improving the baking or food preparation results.